Individual and group retreats are available at one of the few places on earth where one can truly unwind and connect with nature. With no internet connection, guests are instead surrounded by the sounds of nature. 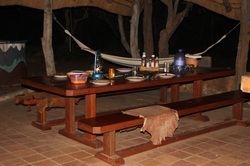 After preparing a meal together on the outdoor gas stove, retreat groups often gather around the campfire, sharing stories and laughs, or just contemplating the evening sounds of the bush: the roars of the White Lions, the jackals crying out to one another, or the calls of hundreds of species of birds. Guests are welcome to go on the open game drives each dawn and dusk to meditate with the White Lions, and see other amazing wildlife, including wildebeest, warthogs, elan, monkeys—and so much more. It's replenishing and nourishing to the soul, and a once-in-a-lifetime experience. * Please note: the majority of funds received from participation fees goes directly towards the care of the White Lions. The US$ rates above are approximate and based on a rate of 10:1 South African Rand to the US$. Please check with your banking institution or currency converter sites for up-to-date figures. Not included:​If you would like to request more information about a retreat at Camp Shidolo, please click here.